The SE Mark Holcomb features a 24-fret, 25.5” scale length wide-thin satin maple neck with 20” radius ebony fretboard, with a mahogany back/bevelled maple top body and stunning quilted maple veneer in ‘Holcomb Burst’. As you’ll see, it’s understated and very, very cool..
As far as pickups are concerned, the new weapon has a pair of Mark’s signature Seymour Duncan Alpha and Omega humbuckers harnessed to a 3-way blade selector switch, volume and push/pull tone control. Shipping tuned to drop C (C-G-C-F-A-D low to high), the SE Mark Holcomb is, as you might expect, an absolute tone monster! “With my SE signature model, we managed to capture all of the defining characteristics of my Maryland-made guitar and turn it into a streamlined, less costly package. It is an incredibly special instrument and one that is the primary focus of my rig in the studio and on stage,” Mark said. 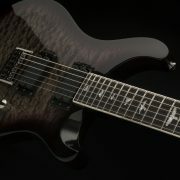 RRP for the PRS SE Mark Holcomb is £899 / €1159 including PRS SE gig-bag. You can check out Mark and his signature SE below! http://www.prsguitarseurope.com/wp-content/uploads/2016/06/SE-Mark-Holcomb_a_2k.jpg 1328 2000 Kieran Morgan http://www.prsguitarseurope.com/wp-content/uploads/2014/06/340-300x137.jpg Kieran Morgan2016-06-28 17:44:202016-06-28 17:44:20SE Mark Holcomb Unleashed!